May 2, 2016 - Is the Bull Market Too Old? 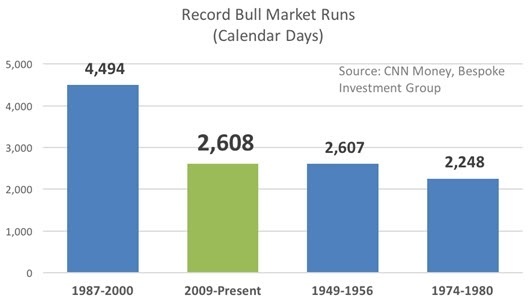 As of Friday, the S&P 500 is on the second-longest bull market run in history, surpassing the 1949-1956 bull market that lasted 2,607 days. The longest bull market in history ran between 1987 and 2000, lasting nearly 4,500 days. After months of volatility and challenges on the horizon, can the bulls keep running? Bull markets don't just die of old age. History shows us that bull markets ended because of a variety of shocks like oil price spikes, recessions, bursting asset bubbles, geopolitical issues, and extreme leveraging. While the past doesn't predict the future, we should evaluate threats to market performance instead of worrying about birthdays. Economic indicators support growth. Recessions have accompanied or presaged many previous bear markets. Even when recession risks are higher this year, most economists don't see an economic downturn in the short-term future. We have experienced healthy pullbacks. One of the markers of a bull market top is elevated investor optimism and unsustainably high stock valuations. Since the last S&P 500 market high in May of 2015, markets have retrenched several times as investors have taken stock of global risks to growth. We haven't seen the irrational exuberance that often foreshadows a bear market turn. Threats to economic growth from China and Europe may prove too much for markets. We don't know that we have seen the worst out of China, and a hard landing of the world's second-largest economy would send ripples throughout the global economy that could threaten markets. Europe is grappling with political, economic, and security issues that could threaten the EU. The Federal Reserve may bungle monetary policy. The Fed is performing a very delicate dance to bring interest rates closer to historic levels. Raise rates too fast and the economy could stumble; raise them too slowly and the Fed could leave itself unable to fight off another economic slowdown. A monetary policy misstep could trigger a market downturn. Corporate profits may continue to fall. U.S. companies are struggling to find growth amid challenging global conditions; earnings declined year-over-year for the fifth quarter in a row last quarter, and continued weakness could cause investors to become bearish about U.S. stocks. The simple truth is that no one can predict market tops or bottoms; plenty of people say they can, but it's all a matter of educated (or uneducated) guesswork. Instead of trying to call markets, what we do is take a look at overall domestic and international fundamentals and create portfolio strategies that align with our clients' overall goals. We can assume that the current bull market will come to an end someday; to reach the #1 spot it would have to continue through 2021, and that's a pretty big stretch. Rather than worrying about when the end might come, we'll adjust portfolio strategies as needed and prudently position our clients for risk. If you have any questions about market strategies for volatile times, please give our office a call. We'd be happy to speak to you. Durable goods orders rise. March orders for long-lasting factory goods like airplanes, appliances, and electronics rebounded but grew less than expected, indicating the manufacturing slump isn't over. Economy grew 0.5% in first quarter. Gross Domestic Product (GDP), the primary measure of overall economic growth, grew just 0.5% on an inflation-adjusted basis, showing that the economy slowed after the fourth quarter of 2015. GDP growth estimates will be adjusted as new data arrives. Consumer sentiment falls in April. One measure of consumer sentiment shows that Americans were less optimistic about their financial prospects last month. Falling sentiment could mean less consumer spending this quarter. Federal Reserve holds interest rates steady. The Fed's Open Market Committee voted to keep rates where they are out of concern about slowing economic growth. Though rates could increase this summer, some think that the Fed will wait until December to hike.